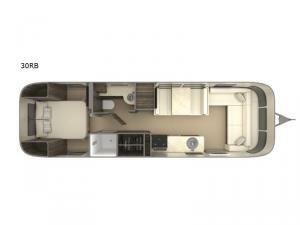 The largest of the International Signature line of travel trailers is this model 30RB. 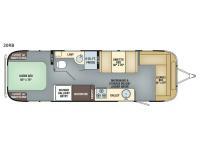 This unit features a rear semi-private bedroom area, complete kitchen with a 8 cu. ft. refrigerator and a lounge area suitable for every family member. The L-shaped lounge sofa can be used for seating as well as transform into an extra sleeping space. The split bath utilizes the units space while still providing you with privacy and complete bathroom amenities. 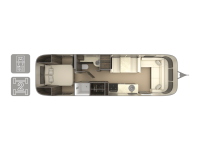 In any Airstream International Signature travel trailer you will find materials to last a lifetime and details you'll appreciate every day. You will love the views of your choosing though the panoramic front windows that also let in tons of natural light. Enjoy sleek polished surfaces like Dupont Corian galley counter-tops, premium fabrics to compliment the Ultraleather seating, and an FM/AM/CD radio with in/out Bluetooth. You will certainly also enjoy the stainless steel front stone guard protection, the torsion axle suspension, and the rear view monitoring system.